Here's another paper that Chylek referred to in his AGU presentation (I blogged the first one here). At that time, his description was vague enough that it wasn't clear where the errors were. But given the full paper, it only took me a few minutes to diagnose some serious (no, fatal) problems. The basic premise isn't wholly unreasonable. Their overall goal is to diagnose sensitivity from the paleoclimate record. Essentially, their paper hinges on the premise that they have two major unknowns to be estimated - climate sensitivity is one, and the other is the forcing effect of a given atmospheric dust loading (aerosol). They simultaneously solve for both of these factors by using two intervals in the paleoclimate record over which the changes in forcings, and the temperature response, are reasonably well known. The intervals they use are (1) the strong warming from the Last Glacial Maximum (21 ka before present) to the Holocene, and (2) the rather smaller temperature change between the LGM and a warmer period which is observed about 41ka BP. 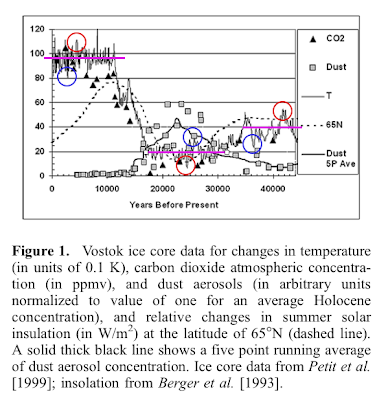 There are observations of the changes in major GHG concentrations across these two intervals, also changes in dust concentration, and observations of temperature, all from the Vostok ice core. Their analysis generates a very large forcing estimate for dust (about 3 times as large as the standard estimates), and simultaneously a small estimate for climate sensitivity of 1.3-2.3C (95% probability interval). The main feature to focus on is the solid wiggly line showing temperature from the Vostok core. The authors claim a temperature difference of 10.2C for LGM to Holocene, and 4.8C for LGM to 41ka BP. They do this by looking for the very lowest single data point in the LGM epoch, and comparing this to the highest peaks in the other eras. There is no attempt at any justification of this choice. I don't know exactly which data points they used, but based on the numbers they quote it must have been something like the spikes I have circled in red. But these values are wholly unrepresentative of the average temperature over the broader time scale and thus badly misrepresent the situation by suggesting that the 41ka warming (from the LGM baseline) is almost half as big (47%, to be precise) as the Holocene. From that graph, the LGM temperature is actually hovering around 20 (on their scale on the LHS, units of 0.1C), the Holocene is clearly below 100 on average (say 95), and the "41ka" peak is actually about 40 if we take an average over several thousand years. I've added horizontal magenta lines to indicate where I think these means lie, at least roughly. Note that they are already averaging the dust measurements over 5 points (~5000 years), and the GHG observations have a similar resolution, so using a temperature average over several thousand years would be entirely consistent and reasonable. To put it another way, if cherry-picking single data points is meaningful, then they could equally have cherry-picked the points I've circled in blue, in which case they would have concluded that the dust forcing is strongly negative, which completely destroys their claimed confidence interval in their publication. If we (reasonably) deduce that this high-frequency variation in temperature is actually a sign of some internal (perhaps regional) variability, rather than a global response to (nonexistent) forcing changes, then the obvious thing to do is take an average over a longer interval, as I've indicated with the magenta lines. The only problem is that as soon as we do that, the need for a strong dust forcing simply melts away, and the resulting climate sensitivity estimate of 2-3.9C is entirely unremarkable (and completely consistent with what we already know). That would still be tighter than many other published estimates, but they've openly ignored several sources of uncertainty in their calculation. There are a few other highly dubious things in the paper (such as their treatment of albedo, and ignoring changes in orbital parameters), but it's hardly worth bothering with lesser nit-picks when the temperature analysis is so clearly flawed. Thankfully, the paper seems to have been largely ignored, but I see that World Climate Report embarrassed themselves by puffing it. That's a shame as I was actually going to write something moderately nice about them (OK, I will anyway, probably over the weekend). I'm metabo - so what! "Metabolic Syndrome" seems to be medical speak for what used to be "fat". I wonder how long it will be before the pharmaceutical industry invents a new syndrome (and the treatment to go with it) for the state of having no identifiable disease. The title of this post is (the translation of) a new book by some Japanese person who argues that being a little overweight is nothing to be worried about. But "metabolic syndrome" seems to be all the rage here, eg our canteen has lots of notices about "metabo" on the tables among the general info on health and diet. The Govt is now apparently jumping on the bandwagon, adding a "metabo test" to the annual health check that all employees have to undertake each year, and even threatening to fine companies that have too many fat people. The real issue behind this is healthcare costs and productivity, of course. Notwithstanding that the obesity level here is way behind the west, it is increasing at quite a rate. So what is this "metabo test"? It appears to be mostly based on a simple waist measurement, with a threshold of 85cm (33.5") to mark the "at risk" population (for women it's 90cm/35.5"). While this has the advantage of simplicity and economy, it can hardly be a reliable measure - I'm on the wrong side of it (after a big meal, at least)! As I mentioned, we already have an annual health check, which has in the past generated the risible result of some flabby wheezing pot-bellied man in a white coat trying to tick me off for gaining a kilogramme over the year, and advising me to try to get out for a brief stroll at lunchtime. Since I already cycle to and from work most days (a hilly 40 minute ride in each direction) I mentally placed his advice in the circular file where it belonged. I'm lighter now than 15 years ago when I was mostly rowing (and pretending to be a student) and frankly a bigger problem is maintaining a healthy weight on Japanese-sized portions (hence the occasional chicken binge, or more likely visit to the local curry). So I am amused by the thought that some wheezing flabby man in a white coat may tell me I'm at risk from "metabo", or that the Govt may fine JAMSTEC for not looking after me properly. Today being Easter, we thought we should have a proper meal. Actually I've been cooking more frequently recently, now I've worked out where the edible food is and how it's packaged (a wander round a Japanese supermarket is a powerful appetite suppressant). But that's another story. A month or two ago there was a minor kerfuffle in the UK press about the "£2.50 chicken". Various TV celebrity chefs were apparently upset that poor people could afford food that was considered a luxury a few decades back, and said the price should be significantly higher. Tesco promptly responded by dropping their price to £1.99. Anyway, yesterday I scoured the shelves of the local supermarkets, and found one single solitary lonely chicken for the princely sum of ¥3000 - that is about $30 or £15 in real money! OK, I realise that the celebs were focussing on animal welfare, and there is probably a genuine debate to be had on that topic, but I don't think that price alone is a good indicator of welfare standards. Given what I have seen of their treatment of pets, let alone how they treat cuddly friendly whales, I very much doubt that Japanese animal welfare standards are that much higher than those in the UK. Instead, the high price is due to Japan being only about 40% self-sufficient in food, and imposing punitive taxes on imports. Still, it was very tasty. Happy Easter! What odds a hot 2008? Via Chris Masse at Midas Oracle, I see that Intrade has a betting market on 2008 global mean temperature being in the top 5 hottest years. As Chris observes, the contract is perhaps a bit vague but for the purpose of this post I will assume they will use the global land-ocean index analysis of NASA GISS, meaning the contract pays for a Jan-Dec mean of 0.55 or more. The current price of the contract is $20 per $100 (bid-offer spread of $15-$25), ie an implied odds of 20%. At first glance, that felt cheap to me, so I had a closer look. 8 years out of the last 10 have satisfied the "top 5" test, which is not too surprising given the overall warming trend. However, temperatures are now in for Jan and Feb 2008, and they are very cold, at +0.12 and +0.26 respectively (note how "very cold" is still well above the 1951-1980 baseline). So it will require a mean anomaly of 0.62 for the remaining 10 months to trigger the payout. That has happened precisely once before, in 2005. Clearly it is not impossible, but it can't be considered likely. We can do a little more analysis to look at the persistence of monthly anomalies. After detrending, the typical e-folding decorrelation time scale of anomalies looks like 4 months or so, suggesting that the relatively cold temperatures will persist for some time to come. That means the latter part of the year will have to really heat up to bring the average up to the top 5 threshold. I'd be more tempted to sell than buy on the contract at the current price, although I've not actually checked the seasonal predictions of modelling centres which could influence my attitude. Meanwhile, in a parallel universe, some people are making noises about "falsifying global warming" by looking at the last few years of temperature data. I suppose one could perhaps ask what observations would falsify gravity (and for that matter, such observations have been made, although AIUI the interpretation is still disputed). Observations of all LW radiation passing straight through CO2 with no absorption would certainly falsify the theory, but I don't expect to see that any time soon. More seriously, the IPCC explicitly predicted a trend of about 0.2C per decade over the next 30 years, if the trend is substantially different from that then (in the absence of some strong external factor) certainly we'll need to revise some aspects of our calculations. 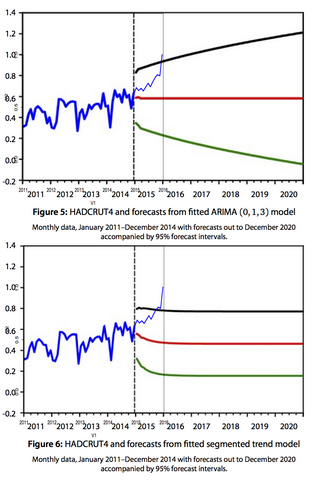 But readers may recall that the Hadley Centre have already explicitly predicted a couple more below-trend years before a continuation of the general warming trend, so I wouldn't get too excited about a few "cold" years, especially when "cold" actually mean "far warmer than most of the historical record, albeit not breaking any global records". "At the big G8 summit of last year everybody agreed that climate change is a serious problem, everybody agreed we need a new global deal once the Kyoto Protocol expires in 2012. "And everybody agreed that everybody should be part of it - including America and China. "What this means is that there is a consensus now right across the world that we need a new global deal and at the heart of it there has got to be a substantial cut in emissions." With such profound wisdom and inspiring rhetoric, he surely cannot fail. He's supposed to be reducing hot air, not adding to it. I've got hold of Piers Corbyn's forecast for March. He predicts that it will be cold, very wet and slightly cloudier than average. According to Philip Eden, he's wrong on all counts at the moment. Cold with fog and frost. Some wintry showers. Wind: light/mod. The Calcutta Cup match was supposed to be "Prob dry. 10% risk of shower." Oh well, there's always next week to look forward to, for which he forecasts. 18-21 Mar (85%) Very wet & windy, thunder and local floods. Gales. Looks like the fun is over for now, as Corbyn has stopped publishing his forecasts. Perhaps he thought his run of failures was getting a bit embarrassing. But it could just be a temporary hiccough, so I'll keep an eye out for new developments. Of course I could get the forecasts by buying them, but I'd rather drill a hole in my head than actually pay for that nonsense - and perhaps more importantly, if I actually entered into a contract then I might have to respect confidentiality clauses which would negate the whole point of the exercise. Whether Piers Corbyn predicted it or not. Not that I had any particular plans, but the longer I stay away, the less I remember of the bad bits. However, every time the memories fade, some more news reminds me. Latest is the planned closure of Jodrell Bank. OK, it's not actually the whole institute, "just" the e-Merlin project hosted there. But by all accounts that's pretty much the same thing. I suspect the distinction is moot for jules' brother who works on the project. The sad thing is, I can't even pretend to be surprised by this - it's just par for the course. But I'll only count that as a single failure since rain and sun are obviously negatively correlated (rain and temp is not so clear: Jan was warm and wet, Feb was warm and dry). (yes, I've learnt how to put tables in to Blogger without messing up the spacing). So either he's been extremely unlucky...or his claimed probabilities are wrong. The lesson here is that at a predicted 80% probability, even with only a modest sample you have to get a fair number majority right, not just the occasional lucky hit. With more months, it will get increasingly implausible that his failures can be put down to bad luck. I haven't even bothered with the string of storm forecasts that have failed so far. March's forecast hasn't appeared yet. I'm not sure what prompted it...but I'm all for people taking money off sceptics. Full details here. Initially ridiculed by many scientists as new age nonsense, today that theory forms the basis of almost all climate science. A small prize (OK, absolutely nothing except your e-immortality assured in a blog comment) for anyone who can identify the subject of that sentence. Small hint: you won't find it in the IPCC report (not that I've searched the text, actually). Lentil-munching sandal-wearing Grauniad readers need not apply (even if they haven't read it yet, cos being lentil-munching sandal-wearing Garudina readers they will instinctively know the answer anyway :-) ). Too crap to publish or too hot to handle? But with all emails to him simply vanishing into a black hole, it soon became clear there was no point in pursuing that route any further. Anyway, by this time the survey results had been spotted by some sharp-eyed journalists, and it was getting mentioned in various places (such as here and here). So Fergus then approached the Nature Climate Feedback blog, asking if they were interested. Olive Heffernan replied that they weren't open to guest bloggers, but that he should send it to Nature Precedings and after it had appeared there she could write about it herself. Nature Precedings is basically a non peer-reviewed preprint service (maybe a rival to the Arxiv?) that merely screens for "relevance and quality". So it was rather a surprise to get a one-line rejection that they were "unable to post your document at this time". The email was anonymous and the author(s) did not explain whether it was because they considered the manuscript irrelevant, or rather than it was too poor quality, or both. Only a minuscule proportion of scientific papers get mentioned in the press, and as I've mentioned this has been picked up in a few places despite having no PR, so it is apparently relevant to some. Obviously I'm biased but the quality of the work and presentation seems well up there with the typical middle-of-the-road conference presentation/poster type of thing (remember we aren't talking high-impact peer-reviewed journals here, just a preprint server). So it seems that no-one wants to publish it, and no-one wants to say why...with Fergus moving on to other things, it seems like we are at a dead end. The first I heard about it was an email from Fergus (who I know via his blogging, but not otherwise) asking for comments on his proposed poll. I was generally supportive of the idea and offered some suggestions on the questions and format. I also participated in the poll (FWIW I was a 5: although I can see some arguments leaning towards 4 and 6, they are IMO not strong enough to justify actually choosing one of these options, even as a half point). Later on, he sent me the manuscript again asking for comments, and I suggested some edits. It was around this point that the question of co-authorship was mentioned, and although my contribution had been rather minor the other two seemed keen to include me and I was happy to accept. I have certainly known co-authors do less work (though not on papers where I was first author)! One can always quibble over details of the wording, but IMO the questions are clear enough, the set of scientists polled is very reasonable and carefully controlled (due entirely to Fergus' hard work) and the results are written up fairly and accurately. Indeed I think it stands in striking contrast with the previous survey of Bray and von Storch, where the questions were more ambiguous (how much do you agree with the sentence "Climate change is mostly the result of anthropogenic causes"?) and the survey was open to anyone who found out about it, including the entire readership of the "climate sceptics" mailing list. Of course the main weakness is in the response rate of ~10%: that leaves open the possibility that the 90% non-responders were either all firmly suportive of the IPCC and saw the poll as a bit of irresponsible trouble-making that didn't justify a response, or all so thoroughly alienated and marginalised by the IPCC that they don't have the energy to grumble about it. Personally, I think the first of these is much closer to the truth, but it seems we will never know for sure. Of course, all surveys suffer from this problem to some extent. I bet all the current polls on Clinton vs Obama have enough refusals to completely dominate the result, were they all to end up on one side of the fence. Yet you don't see reports saying "Clinton 22%, Obama 24%, and the other 54% slammed the phone down".